Christ in You - Laminin | Byron Howell Ministries, Inc. I was blessed to hear Louie Giglio speak at the Chris Tomlin Christmas concert the other day in Clearwater, Florida. By the way that was an awesome concert and I highly recommend you go. But anyway I heard his sermon and remembered another sermon I heard from him over a year ago. I love how the apostle Paul tells Timothy to avoid oppositions of science falsely so called. Now I was an English major but I love certain aspects of science, especially theoretical physics (which often deals with the origin and actions of the universe). I have never heard the first piece of credible scientific information that shakes my full belief in all the Words of the Holy Bible and the main doctrines of Christianity. So here is a biology lesson that I know will bless you, by Louie Giglio. 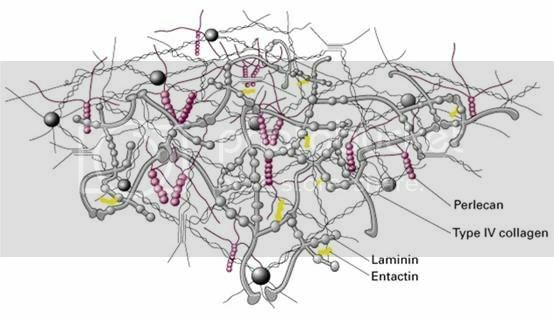 Below the video please see another great diagram of laminin and how it interacts with other elements in our bodies. This explanation of laminin is, admittedly, one of those things that skeptical people probably won't buy. But me, I'm a believer and I'm looking for God in our lives all the time. When you are open to God and looking for Him, you will see Him more and more. When you don't believe in God and aren't looking for Him, without His supernatural grace you will never see Him. Another great diagram of laminin, look at how the cross works in us - Praise the Lord. This is the foundation of our being. Laminin is vital for the maintenance and survival of tissues.